It’s almost June, so I guess summer is here! I love summer foods, especially grilling. I eat a lot more hamburgers, hot dogs and potato salad than is good for me during the summer, but grilled chicken is one summer food you don’t have to feel guilty about. 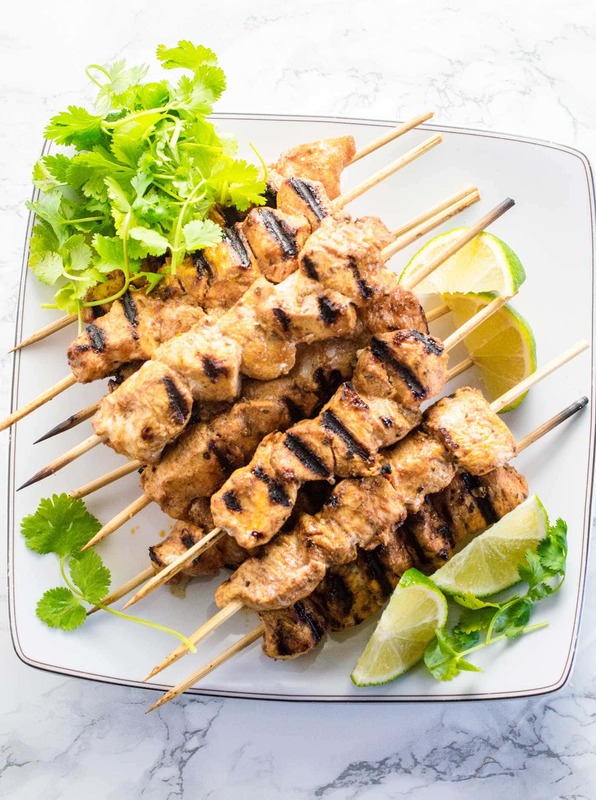 I love these Chipotle Lime Chicken Kabobs because they’re delicious, high in protein and low in calories, and because all foods are more fun when you serve them on a stick! Making meat, vegetables or fruit into kabobs just makes the food seem a little more fancy. 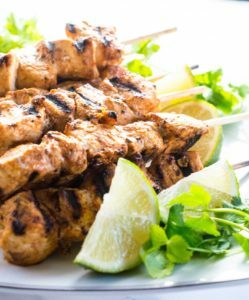 This recipe for Chipotle Lime Chicken Kabobs takes only about half an hour to make, but you do need to allow time to let the chicken marinate for anywhere from 30 minutes to overnight. The kabobs are moderately spicy, so they’re popular with both kids and adults. Trim the fat and tendons from boneless, skinless chicken breasts, and cut the meat into one-inch chunks. If the pieces of chicken are larger than one inch, they will probably burn on the outside before they are cooked inside. If you want larger chunks of chicken, it’s no big deal, but you will probably have to finish the kabobs in the oven to avoid burning them. For the marinade, mix together lime juice, olive oil, chipotle chili powder, oregano, garlic salt and dried coriander. This marinade is really more of a wet rub, because it doesn’t contain much liquid. Pour the marinade all over the chunks of chicken, then mix and massage with your hands so every piece of chicken is coated with spices. I’ve tried to skip this rubbing step, but it’s not a good idea. With any spice rub, you actually need to rub it into the meat a little bit. If you don’t want to use your bare hands, you can put the chicken and marinade in a large plastic bag and then massage the bag to coat the chicken with spices. Let the chicken marinate for at least 30 minutes, and no more than 24 hours. I usually let it sit for about an hour. If you are going to let it marinate for more than 2 hours, put it in the fridge. While the chicken is marinating, soak 12 wooden skewers in water for 30 minutes or more. When I made these kabobs, I had 12-inch skewers, but they were a little too long, so I cut about 3 inches off each of them. Distribute the chicken evenly on the 12 skewers. You can cook these kabobs on an indoor grill pan, or on your outdoor grill. You can see from this photo that indoor grilling creates a fair amount of smoke, so turn on your fan and maybe open a window or two! If you’re looking for a side dish for your kabobs, try Avocado Green Rice or 5-Ingredient Spanish Rice. Place 12 wooden skewers in cold water. Cut 3 pounds chicken breast into 1 inch chunks. Don’t make the chicken pieces much larger than 1 inch, because with larger pieces the outside may be burned before the inside is cooked. Combine spices in a large bowl. Add lime juice and oil, and mix well. Add chicken chunks, mix and rub with your hands until chicken is well coated. If you don’t want to use your bare hands, put the chicken and spice rub in a plastic bag, and knead the bag until the chicken is well coated. 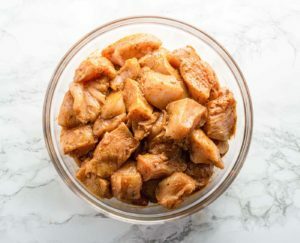 Allow chicken to marinate for at least 30 minutes, or as long as 24 hours. If marinating for more than 2 hours, put the chicken in the refrigerator. 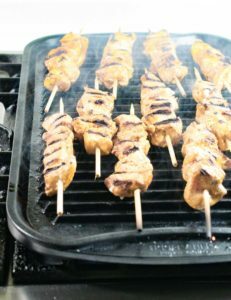 Divide the chicken chunks among the 12 skewers. Cook on an outdoor grill or indoor grill pan over medium high heat for 4 minutes on each side, or until outside is slightly charred and chicken is cooked through. Cook the chicken to an internal temperature of 170-175 degrees, measured with an instant read meat thermometer. If the chicken is getting burned on the outside before it reaches the desired internal temperature, remove the skewers from the grill, put them on a baking sheet, and place in a 400 degree oven for about 5 minutes or until they reach 170 degrees. Nutrition information is for 1 kabob.